The upper unit uses high quality fabrics in order to provide a secure and comfortable coverage. Irritation-free wearing is part of what the upper unit provides, so runners were happy with it. Runners were appreciative of the anti-microbial and anti-moisture sock liner. Asics offers many color schemes when it comes to their shoes and the Asics DynaFlyte is no exception. Landing impact is handled by the comfortable and durable platform. A very lightweight mid-sole foam offers continuous cushioning and support that’s very easy on the foot. Durable carbon rubber in the outsole unit protects the shoe from abrasion. This shoe is a bit expensive. The Asics DynaFlyte is gaining momentum when it comes to the comfort and efficacy of the wearer. This neutral shoe gives responsive cushioning that’s going to feel like nothing when taken to the races or daily running sessions. A striking look certainly adds to the appeal of this running shoe. Asics! The Dynaflyte is named after Asics’ new midsole material, Flyte foam, which is lighter and softer than standard midsole foams. The Flytefoam midsole gives the shoe a soft and protective feel of a daily trainer, yet the lightweight design gives the shoe the potential to be an up-tempo trainer or marathon racer. The Dynaflyte has comfortable, soft woven upper. The piece of woven material has enough structure on its own which makes no overlays necessary. The woven upper is moderately breathable. My feet heat up more in the Dynaflyte than in other shoes which caused a blister to form on the ball of my foot on hot days. The Dynaflyte has a thick, double layer tongue. It does a good job at preventing the laces from creating pressure points on the top of the foot when they are tied very tightly. Asics tends to put too much support in their neutral shoes. Asics wanted to make the Dynaflyte as lightweight as possible, so they were forced to decrease the plastic usage, however, the Dynaflyte still has a very substantial heel cup. The heel cup spans the entire height of the heel and wraps far around the rear of the foot. The heel collar has a comfortable, but not an excessive amount of cushioning. The rest of the heel area does not have any cushioning. My heel is almost in direct contact with the hard plastic heel cup. Asics does not put any material to cushion the heel cup because they are trying to cut down on weight. 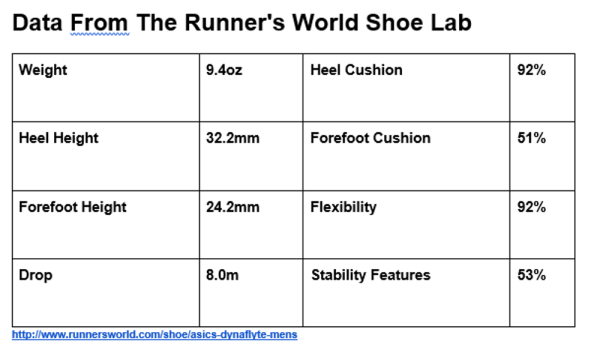 The heel cup is not too uncomfortable, however, I think that Asics has its priorities in the wrong place if they are trying to make a lightweight shoe. A less substantial heel cup and more cushioning material on the upper would be desirable. There is a small area of reflective material on the outside of the heel counter. The Dynaflyte has a standard fit. A wide, accommodating heel and midfoot area and a tapered off toe box. I can get a good lock down with the laces so that my foot doesn’t slide around in the shoe. I find that the toe box is slightly uncomfortable. The toe box is curved such that my big toe is forced to bend inwards. This was both uncomfortable and impractical. The big toe plays a large role in the push off the stage of the gait cycle. When the big toe is straight, it is as powerful as it can be. Even a little bend in the big toe significantly impacts the power that you can deliver the ground. Asics should have constructed the shoe with a straighter fit because there is no benefit to a tapered toe box, apart from a more natural look. The Dynaflyte has a dynamic cushioning system consisting of a layer of gel on top of a thick slab of Asics new Flyte foam. Flyte foam is an amazing material. Flyte foam is a softer foam compound than standard EVA. It is 55% lighter than Asics’ other midsole foams, yet it delivers just as much cushioning. Flyte foam is also more responsive than Asics’ other midsole foams. Durability is also not an issue with the Dynaflyte. I have run 300 miles in my pair of Dynaflytes and they still have plenty of life left in them. The Dynaflytes’ gel top sole also adds to the soft ride of the shoe. My foot quickly displaces the gel top sole at foot strike which gives the midsole an even softer feeling. Although the ride is very soft, the midsole does not bottom out like other soft shoes. The Dynaflyte has an 8-millimeter drop. This is a comfortable amount for both heel strikers and forefoot strikers. Heel strikers tend to want more drop because it makes their heel to toe transition time faster and because they need more cushion built up underneath the heel than underneath the forefoot. Forefoot strikers tend to like lower drop shoes because they don’t need heel cushion. The heel cushion adds weight and sometimes impedes their natural running style. My running form is very different before a race to after the race. I gracefully forefoot strike before a race and sloppily heel strike after a race. I could very comfortably use this shoe as my warm up and cool down shoe for races. The outsole is made of strategically placed pods of high abrasion carbon rubber and exposed Flyte foam. There is also a medial post underneath the midfoot which unnecessarily adds support. The rubber is placed around the perimeter of the heel and in the whole forefoot area. The rubber provides great traction and durability. The exposed Flyte foam gets pretty beat up. The little stones on the road dent the foam and cause it to wrinkle. I tried running on trails with the Dynaflyte and the rocks and roots just chipped away at the foam. This does not affect the cushioning much at all. Asics always likes to sneak extra stability features into neutral shoes. They cut a groove in the middle of the outsole that spans the length of the shoe, to help correct any bio mechanical imbalances. Eighty percent of all runners pronate, yet the majority of runners wear neutral shoes. This groove is a way that Asics helps pronators wearing the Dynaflyte without obstructing true neutral runner. Since I am a truly neutral runner, I cannot attest to how much support this technology provides. The Dynaflyte has the soft cushioning of a heavy daily trainer and the weight of an uptempo performance shoe. I simply used it as any other daily trainer and enjoyed the lightweight feel. I don’t feel like I am missing anything with the reduced weight. I can also see this shoe being used as an up-tempo trainer or marathon racer for those who like a lightweight shoe with a ton of cushioning. This shoe is really only for road running; the midsole gets very beat up on trails. +0.5 indicates that you should buy 0.5 sizes larger in a different shoe; +1 indicates that you should buy 1 size larger in a different shoe. The Triumph is Saucony’s plush cushioned daily trainer. Both shoes have the same amount of cushioning. They both have an 8-millimeter drop. The Triumph weighs more than an ounce and a half more than the Dynaflyte. For that weight, you get a more durable outsole and a heavier, more responsive midsole. The Triumph has a better lacing system which gives the shoe a more secure fit than the Dynaflyte. Asics claims that the Dynaflyte provides the same amount of cushioning to the Nimbus. I think that the Nimbus provides just slightly more cushioning than the Dynaflyte. The Nimbus is Asics’ built up daily trainer. The Nimbus has more stack height, more outsole rubber, more plastic pieces, more drop and a whole lot more weight. The Nimbus is a better daily trainer for heavier runners whereas the Dynaflyte is better for lightweight runners. Buy ½ up in the Nimbus. The Torin 3.0 has a very similar ride to the Dynaflyte: Very soft, yet fast. The difference is that the Torin is only for forefoot strikers whereas the Dynaflyte is suitable for both heel strikers and forefoot strikers. Unlike the Dynaflyte, Torin’s midsole tends to completely compress before I have finished unloading my landing force into the shoe. The two shoes have similar weights and similar rubber outsole coverage. The Torin has a comfortable, wide toe box. The Dynaflyte has a more breathable upper than the Torin. The Clifton 4 has even more soft cushioning than the Dynaflyte. The Clifton is also a faster, more responsive shoe. The two shoes weigh about the same amount. The Dynaflyte has a more comfortable upper than the Clifton. The Dynaflyte also has more support than the Clifton. The Clifton has only a 5-millimeter drop, however, the Meta-Rocker technology makes the shoe feel comfortable for heel strikers, just like the Dynaflyte. Buy a ½ size up in the Clifton. Buy a ½ size up in the Clifton. Both shoes have about the same amount of cushioning, however, the Ghost 10’s cushioning is a little bit firmer than the Dynaflyte. The Ghost is also about an ounce heavier than the Dynaflyte. The Ghost has a 12-millimeter drop, compared to the 8 in the Dynaflyte. The two shoes have a similar ride. The Ghost has a more comfortable, secure fit than the Dynaflyte. Buy a ½ size larger in the Ghost. Dynaflyte! I would like it better if the Dynaflyte had a more breathable upper and a toe box that was less tapered. I also think that they could decrease the weight a little bit more by getting rid of the medial post and by trimming the heel cup. This is a neutral shoe after all. The Dynaflyte has the ride and the cushioning properties of a standard daily trainer, yet it weighs more than an ounce less. The Dynaflyte costs 140 dollars, which is 10 dollars less than the standard $150 for a high-end premium cushioned daily trainer. These factors make the Dynaflyte a great choice of shoe. After all, why pay more to tie extra weight to your feet? I am a guy with a heavier built weighing 80 kgs and with a stature of 1.82m with very wide feet. I always have had troubles finding the right pair of running shoes in terms of cushioning, durability, cushioning and the shoes being light at the same time. I'm writing this review after running more than 70km on Asics Dynaflyte. Being a guy of a heavy set and having had serious spinal problems, I always run on shoes with a very high heel-toe drop. I thought the Dynaflyte with a lower drop (8mm) isn't going to provide a cushiony ride and I was totally wrong. They are so cushiony and very springy. It is easier to land on midfoot to toe with the 8mm drop. After more than 70km of high tempo runs on asphalt, I don't see wears and tears of any sort. The outsole still looks pretty much the same. Top layer material looks very durable as well. The build quality is very high. I believe that they are going to last somewhere between 700km - 800km very easily. I am a mild supinator with high heel arches. Dynaflyte has small arch supports (bumps), which let my heels rest on them. So I feel more secure and comfortable as my arches are very well placed on the soles which are not possible in shoes without arch supports. I am so confident that I am never going to supinate while running on them. I would highly recommend dynaflyte for people with normal to high arches. I wear EU size 47 (US 12) and I find it difficult to wear many regular width shoes from many reputed brands. Dynaflyte runs so true to the size. Even though Asics don't provide extra wide options, they still feel comfortable at the widest point of my feet. Whereas many of my old running shoes from different brands run very narrow for my feet at the widest point (Ex: Speedcross 4, Ignite V2). I would recommend people with wide feet to give Dynaflyte a try. The appearance of the Dynaflyte is a huge add on. They have got some cool color combinations which make them look so trendy. I also have tried them for few casual outings and they looked very nice with my casual outfits. I am so happy with the design and the looks of these shoes. Dynaflyte with EU size 47 weighs almost 300gms. I think it's a huge step forward in the whole running shoe industry. The best part is the cushioning and the amount of comfort with such light weight. They are a pair of MAXIMALIST SHOES with a MINIMALIST WEIGHT. I've run my fastest 5k till date on them. They help me spring back so high on each stride with a cushioned thud back again on the ground. I generally run early morning or late evening. Once I did run 10k during a hot afternoon and had slight burning sensation between mid feet to heel zone. I literally felt the heat building up each km. Dynaflyte's upper material probably isn't very breathable. So I don't recommend these shoes for mid day and very hot weather running. Looking at all the strong positive points, this one drawback isn't going to stop me from using the Dynaflyte. It is such a small compromise for getting these many huge benefits. After running in the Asics DynaFlyte, I am once again a believer in the Asics brand. I previously used to wear the DS Trainer line for all speed work and races, and am excited that Asics has once again made a shoe that I really liked running in. DynaFlyte beats this challenge and breaks the 300g barrier, becoming ASICS’ lightest running shoe. The DynaFlyte from Asics is a shoe that’s touted to have a platform that’s very lightweight and super consistent when it comes to delivering cushioning to the entire foot. Like its name, it uses ‘flight’ as a philosophy to its purpose and functionality. The sole unit propels the runner forward and lets them land comfortably on a platform that’s soft and springy. The upper unit utilizes strong, but flexible fabrics in order to keep the runner’s foot safe and secure. As it wraps around the foot, the upper allows air to ventilate the interior, thus preventing sweat or moisture. A seamless interior construction allows the wearer to use this shoe without socks. Antimicrobial support is given by the sock liner. Organic fibers that have been combined to make a foam were used as the basis for the mid-sole unit. It’s lightweight and comfortable, but it’s also very durable and resilient. Bounce-back mechanics allow the wearer to land on the ground free from discomfort, and then be propelled to the next phase of the step with ease. The outsole unit utilizes a high quality rubber compound that’s highly resistant to abrasion. Widely used in Asics shoes, this layer of protection is effective when it comes to shielding the rest of the sole unit from wear and tear. Traction is part of its service, as well. The DynaFlyte is true to its size. It uses the standard measurements in order for men and women to get the right fit for them. The available width is medium, so it accommodates the runner who has a medium sized foot. Its semi-curved shape follows the natural curve of the human foot. The AHAR® or the Asics High Abrasion Resistant Rubber is the layer that’s used for the Asics DynaFlyte. It is also used in the DynaFlyte 3. It’s thick enough to deliver sure protection that lasts a long time. It doesn’t peel off easily, though. As it shields the mid-sole from the abrasive nature of the roads, it also delivers traction for optimum surface control. The FlyteFoam™ is one of the most lightweight foam units Asics has ever made. It is advertised to be 55% lighter than the standard EVA foams used commonly in running shoes. Reinforced with malleable fibers, this foam is able to bend when the foot is weighing down on it and then spring back into place during toe-off. That’s how it makes the ride more responsive. The Impact Guidance System or IGS® is part of the design philosophy of the Asics DynaFlyte. It enhances the foot’s capability to go through the gait cycle with ease and comfort. It makes sure that the foot strikes in a balanced and comfortable manner. A vertical flex groove in the forefoot called the Guidance Line leads the foot towards a more efficient gait. It prevents wobbliness when stepping and toeing off. Durable, but soft fabrics are used for the upper unit. They are intricately woven to stay free from tearing or any potential damage. The whole upper actually wraps around the foot in a comfortable manner, but it doesn’t discount a snug fit that’s also secure. The seamless upper construction keeps the foot safe from irritation or any spots that might lead to blistering or chafing. 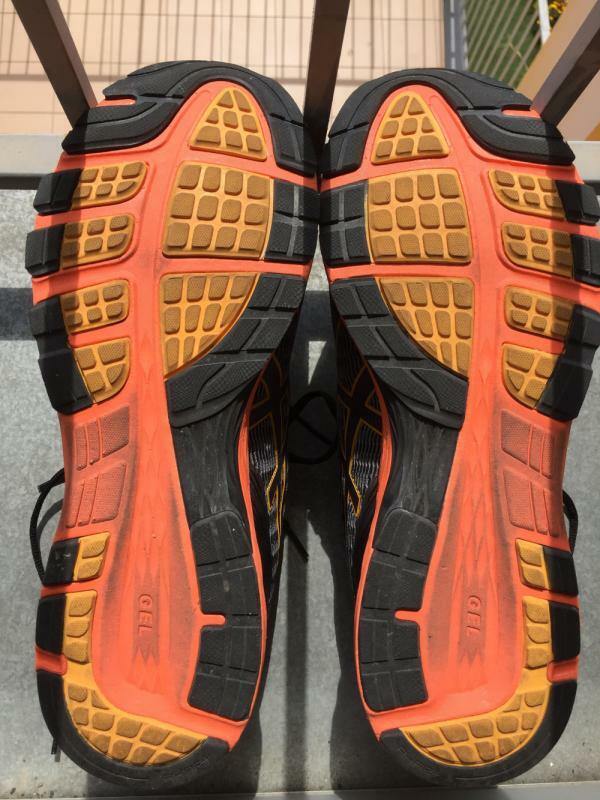 The runner is able to wear this shoe without socks. The ComforDry Sock Liner adds more cushioning to the immediate underfoot. And it’s treated with an anti-bacterial coating, making the interior environment of the Asics DynaFlyte clean and healthy for the foot.